This fully adjustable and durable karaoke monitor is a necessity for every karaoke gig. Removable locking casters attach to a durable high-impact plastic base and allow for easy transport for the KJ on the go. 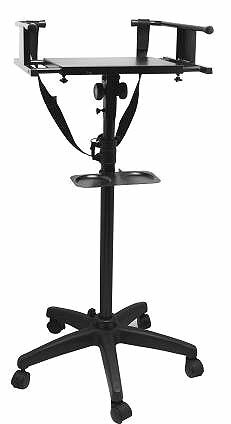 Five pre-set pin locking positions and a friction locking clutch make this stand height and angle adjustable. Complete with two microphone holders that can be removed for transport. Includes a tray for 2 drink cups and a nylon strap to keep the monitor in place. Platform width adjusts from 13.5”-24” with dual locking knobs and a nylon strap will keep your monitor in place. Height adjusts from 36”-56” with line-it-up adjustments and a locking pin for added security. Tapered shaft with friction locking knob for quick and easy assembly. High-impact plastic leg housing with 5 legs and removable lockable casters.